By D Magazine | 5 years ago We love Central Market and Whole Foods, too. But we went in search of the top local shops that sell and make the city's finest meats, cheeses, produce, and more. It was a delicious journey. Who’s Out to Get Mike Miles? By Zac Crain | 5 years ago A series of early missteps left the Dallas ISD superintendent at the center of a media feeding frenzy. Two years later, he has a shot at engineering real change. By Michael J. Mooney | 5 years ago He followed his big brother everywhere, all the way to extreme-sports superstardom. Then Caleb was killed in the X Games, and Colten had to decide what to do next. By Steve Jacob | 5 years ago The area's population will top 2 million by 2030. The people have money. And the doctors have noticed. By D Magazine | 5 years ago The top 275 physicians in 38 specialties as voted by their peers. By Eric Celeste | 5 years ago There’s one easy way to radically reshape City Hall. $100,000 salaries ought to do it. By Cristina Daglas | 5 years ago The face of Face the Nation and the namesake of TCU’s journalism school opens up. By Farraz Khan | 5 years ago DFW NORML is training citizen-activists to lobby for the legalization of cannabis in Texas. First step: don’t look like a pothead. By Eve Hill-Agnus | 5 years ago Don’t be fooled by the exterior of the fixture at the lake. By Nancy Nichols | 5 years ago Where to get your meat fix. By Nancy Nichols | 5 years ago Shop the city's finest fishmongers. By Nancy Nichols | 5 years ago Where to buy the finest loaves in town. By Todd Johnson | 5 years ago Plus how to build the perfect cheese board. 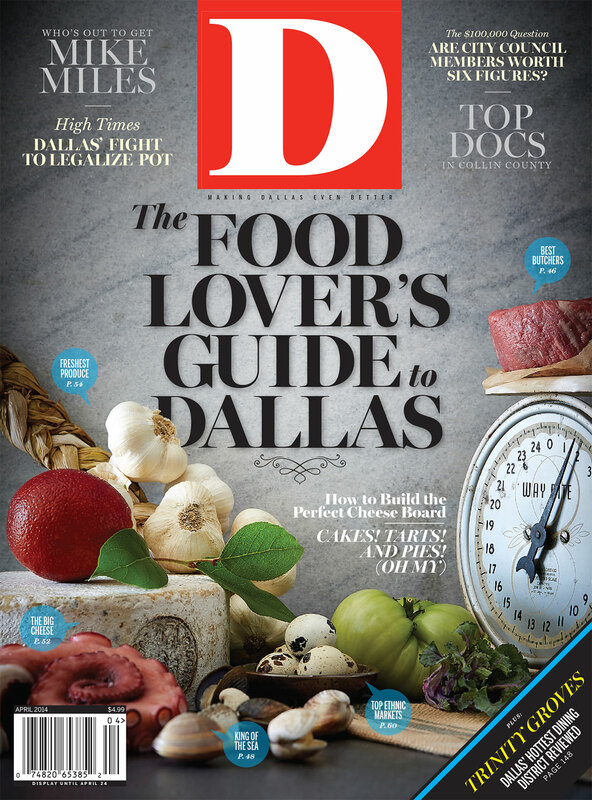 By Carol Shih | 5 years ago Flavorful local produce is available throughout North Texas. By Carol Shih | 5 years ago Eating fresh and primarily local is easier than ever. Choose a share size, pick up your box, and enjoy. By Todd Johnson | 5 years ago These local bakeries can satisfy the sweetest of teeth. By Nancy Nichols, Carol Shih, Cristina Daglas | 5 years ago Get a taste of the old country—whichever country that might be. By Nancy Nichols | 5 years ago Monica Greene goes for groceries like only she can. By Nancy Nichols | 5 years ago The Trinity Groves district in West Dallas continues to flourish. By Carol Shih | 5 years ago Order the fish at this Trinity Groves spot in West Dallas. By Carol Shih | 5 years ago The chicken lollipops are reason enough to dine. By Tim Rogers | 5 years ago A YMCA locker room mystery. By Cristina Daglas | 5 years ago Epidemiology analyst Daphne Quick and chief epidemiologist Jawaid Asghar, both of Collin County Health Care Services, offer advice for now and next year. By Todd Johnson | 5 years ago Enjoy the city's finest beans. By Carol Shih | 5 years ago Local markets for all your gourmet needs. By Carol Shih | 5 years ago You won't find these flavors in a carton of Blue Bell. By Nancy Nichols | 5 years ago Where cocoa addicts can get their fix. By Tara Nieuwesteeg | 5 years ago How does this Trinity Groves spot keep its beer fresh? By serving a lot of it.